Despite the fact that we’re supposed to get SNOW tomorrow (ugh), I am still moving full steam ahead with all things spring. And asparagus is at the top of the list! Asparagus, believe it or not, was my favorite veg as a kid. I always had seconds, to the shock and awe of all adults in my presence. I loved it, and I thought munching on the little stalks was fun. 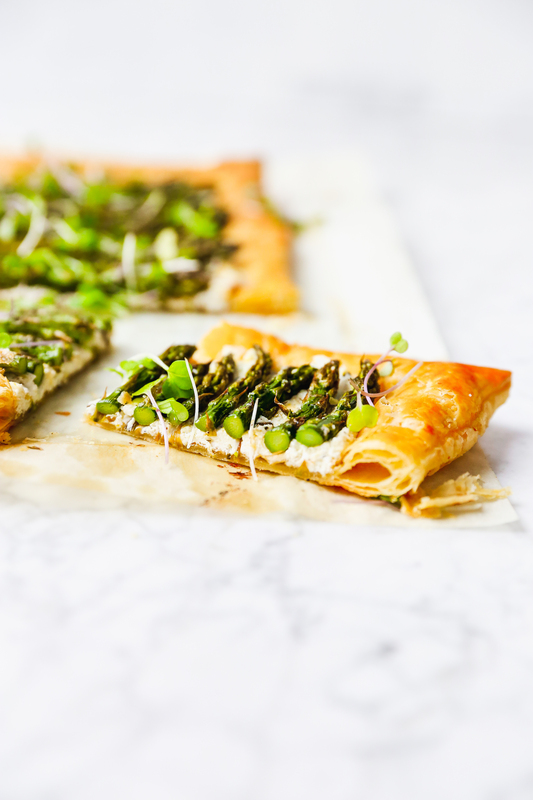 To this day, spring asparagus remains one of my favorite green things. I love it roasted, grilled, steamed with a little butter, or even raw (it’s great in a salad when very thinly sliced). It’s beautiful and delicious, and extra tender when in season. 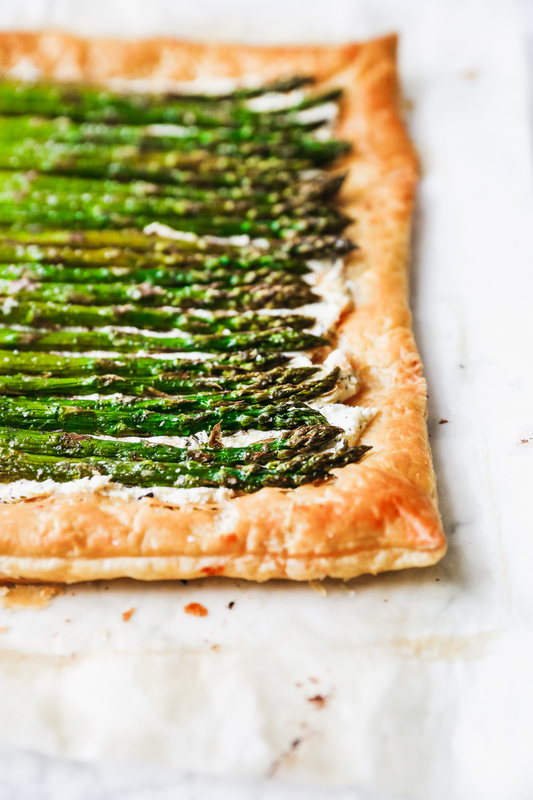 This tart is a super easy and elegant way to use up all those asparagus bundles! It starts with store bought puff pastry, rolled out and baked until juuuust golden brown. Then! A delightful mix of goat cheese, garlic, herbs, and tonsss of lemon zest gets spread all over the surface. Holy flavor bomb! The goat cheese mixture would be great in/on so many things. I am thinking a sandwich may be in its future. And mine. 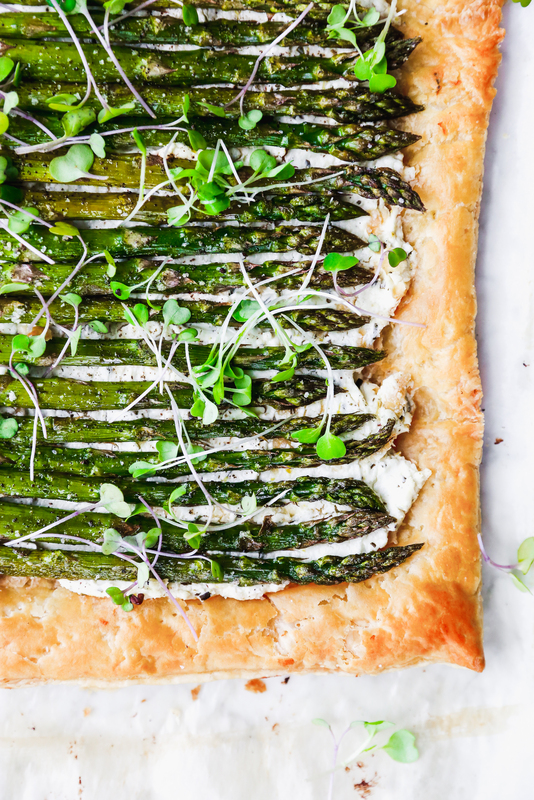 The goat cheese layer gets topped with our beautiful roasted asparagus, tender and juicy and seasoned perfectly with a little olive oil, salt and pepper. Into the oven it goes and then magic happens! 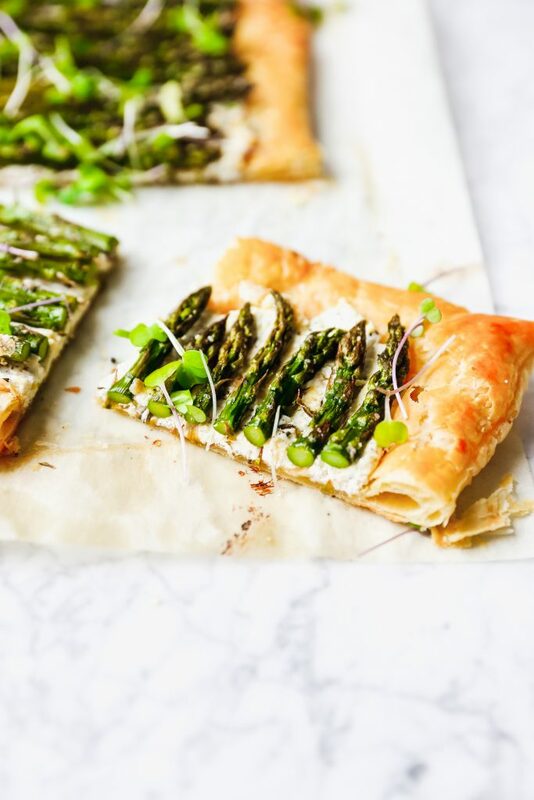 Puff pastry is definitely one of my absolute favorite, go-to store shortcuts, and it delivers every single time. Look at those crispy, puffed edges! Gah. I want to curl up into one of those buttery little air pockets and eat my way out. It makes “fancy” dishes soooo simple. Really, anyone can do this. You can’t mess this up. Oh my word. It is so wonderful. 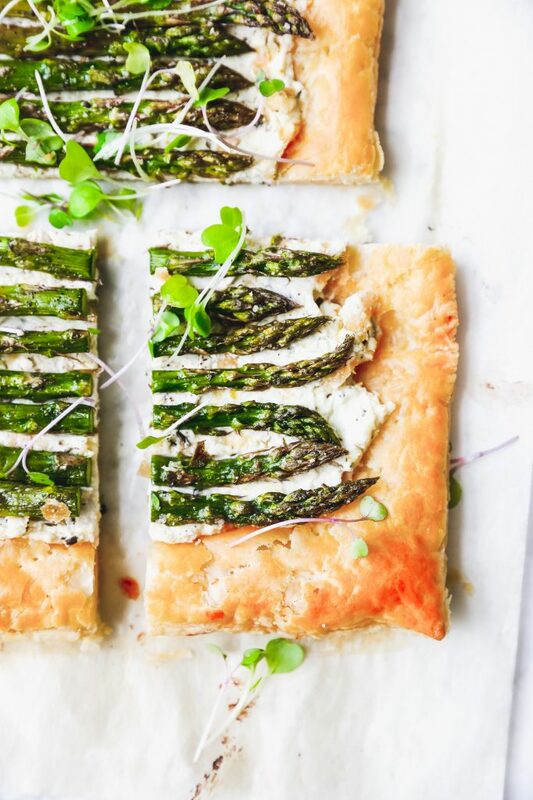 The buttery pastry crust cuts the tang of the goat cheese just so, and the flavor of asparagus rings true. I originally planned on grating parmesan all over the surface of this after it came out of the oven, but really, after one bite, I nixed the idea. It just didn’t need it. The textures and flavors were spot on! And you KNOW if this girl is saying no to more cheese, it has to be pretty fabulous without it. 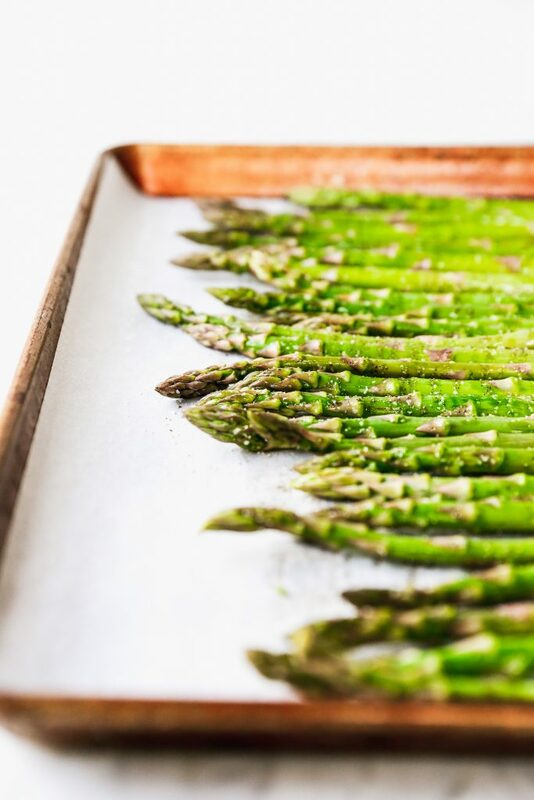 Spread the asparagus out on the lined baking sheet in an even layer and drizzle lightly with olive oil. Season with salt and pepper. Roast for 10-12 minutes or until the asparagus is tender. Remove from the oven and set aside to cool. Meanwhile, unroll the pastry onto a lightly floured surface and roll out gently with a rolling pin. You just want to thin the pastry out a little bit so you have a larger surface to work with. 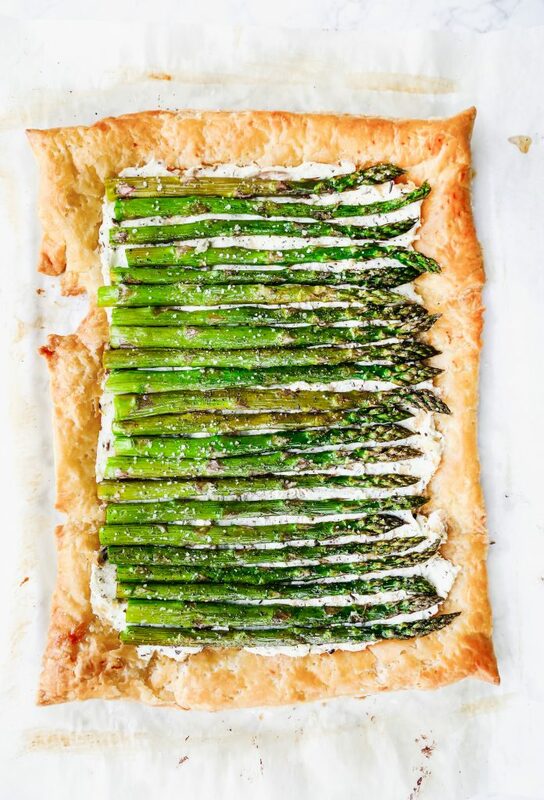 Remove the asparagus from the baking tray, put down another sheet of parchment paper, and then transfer the pastry to baking sheet and prick all over with a fork. Beat the egg in a small bowl with a splash of water and then brush the egg wash all over the surface of the pastry. Place the baking sheet in the oven and bake for 10 minutes or until the pastry starts to turn a light golden brown. Remove from the oven and gently push down any puffed parts. Meanwhile, stir together the herbed goat cheese, cream cheese, garlic, and lemon zest in a small bowl. Season lightly with a pinch each of salt and pepper. 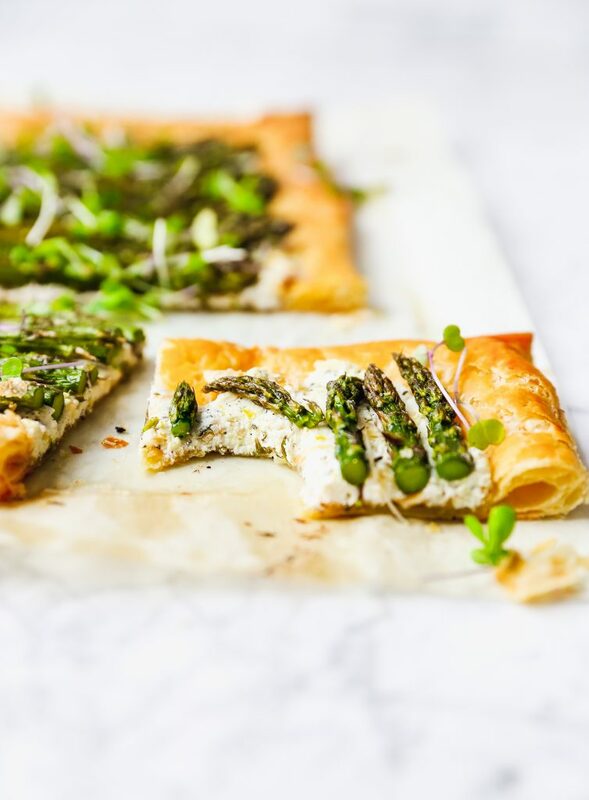 Spread the goat cheese mixture all over the surface of the puff pastry, leaving a 1-inch border around the edges. 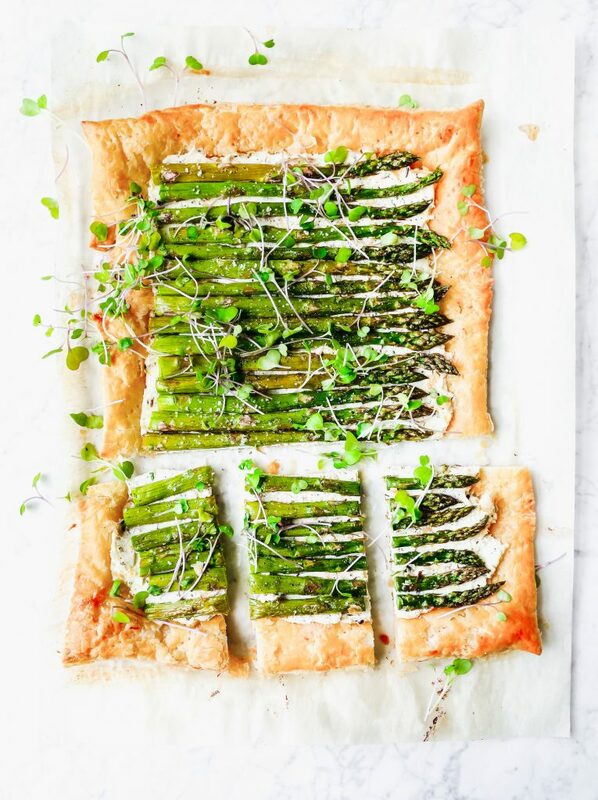 Arrange the asparagus spears in a single layer over the goat cheese, season everything with another pinch of salt, and then return the baking sheet to the oven for another 8-10 minutes, or until the pastry is golden and puffed around the edges. Cool for a few minutes on the pan before removing and slicing. Serve warm or at room temperature.